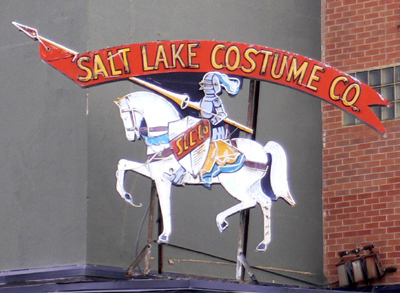 Last November, I wrote about the closing of The Salt Lake Costume Company. The building still sits vacant. Taggers have sullied its windows with graffiti and the sign still says that there is a clearance on costumes. I was very touched to see that someone besides me mourns the death of the costume company. My grandfather, Clifford Allen, owned it from sometime in the 30s or 40s until his death in 1987 at the age of 81. My grandmother passed away two years after him, and my dad, his two brothers, and two sisters didn’t know what to do with it, so they sold it. I drove by it yesterday (Aug. 6, 06) and was very nostalgic it’s still there, but sad about it’s condition and demise. The costume company burnt down in the Winter of ’63, approximately, but I was way too young to remember it. My dad and uncles spent almost a year rebuilding it from scratch. I hope it doesn’t seem too weird to be so sentimental about a building, but that was such an integral part of my life, for so many years. I played there as a child, worked for my grandfather (who would usually pay my brother and I a dime, or a quarter, for the entire day, which was generous considering we had usually played hide ‘n seek amongst the costumes all day!). I worked there even when I was a college student, even though I never made more than minimum wage. It was so much fun working there, though, I didn’t want a job that paid more! Yes, please go ahead! I would be flattered. [My grandfather’s] last living sibling, Thelma, died only a few months ago. Every one of his numerous siblings lived past 95, several past 100. He was diagnosed with cancer several months after shocking his entire extended family by announcing that he was becoming World weary, and wouldn’t at all mind if God called him home soon. My oldest Brother told me several years ago that the cancer he died from is extremely rare, except for people who work in the dry cleaning industry, for whom it is relatively common. I still remember lighting the boiler in the morning, which was right next to the dry cleaning equipment, and smelling the pungent smell of perchlorethyelne, which usually made me dizzy. My parents and/or my brother might have some pictures from the costume company’s earlier days, if you’d like to post any more. I told him I would be happy to post whatever he submitted. I loved the Salt Lake Costume Company. I don’t know how anyone who passes its vacant walls can’t grieve a little.